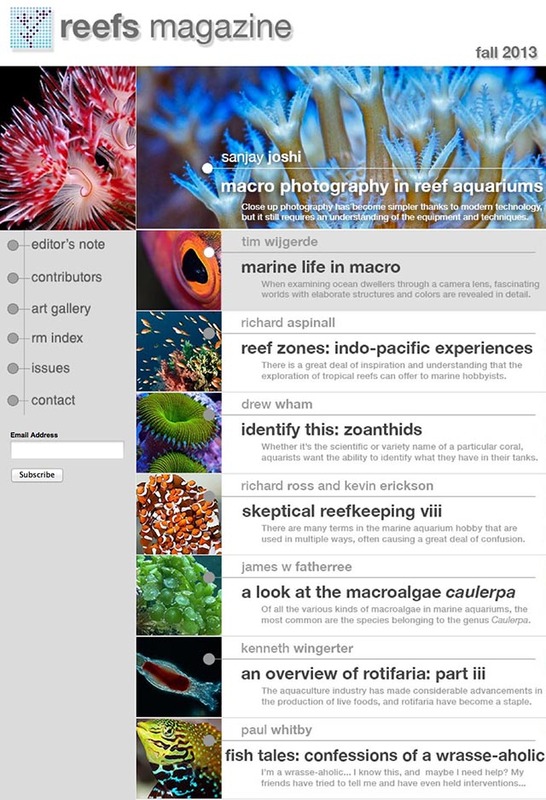 Reefs Magazine is pleased announce the release of their MACNA MEGA issue. The largest issue of Reefs Magazine to date contains in-depth and wide-ranging material for all interests. The featured article is from our old friend Sanjay Joshi, who delves deep into the technical aspects of producing high quality Macro Photography for Coral Reef Aquariums. We all know that good macro photography is the corollary hobby to reef keeping, and Sanjay lays out all the equipment options, the techniques, and potential pitfalls involved. He also treats us to many of his incredible photographic images. Tim Wijgerde’s Marine Life in Macro illustrates the breathtaking worlds that can be seen through close up aquarium photography. In the process, he also provides us with a primer on the basic biological characteristics of the animals we commonly keep. Next, Drew Wham begins his Identify This series, laying out a systematic and up-to-date review of the Zoanthids, detailing how through careful inspection we can accurately ID the various morphs and “trade names” to true species. Richard Aspinall takes us underwater to explore the various Reef Zones of the Indo-pacific asking us to pay close attention to nature and let it guide us in the ways we set up our systems. In Skeptical Reefkeeping VIII, Rich Ross returns along with newcomer Kevin Erickson to remind us that words matter and they ask us to pay close attention to the words we use when we talk about the livestock we keep. James Fatherree details the various types of Caulerpa Macroalgae available to hobbyists and Ken Wingerter completes his 3-part series on the taxonomy, biology, and culture of the tiny, but invaluable Rotifers. Finally, Paul Whitby examines his own inner psyche as a self-confessed and unrepentant Wrassaholic in our latest Fish Tales offering. Throw in the fantastic art gallery photographs of Nick Hobgood and there is certainly for everyone. Reefs App – Version 4 Launches Today!